Thankfully I have finally finished the bridesmaid's dress today (would you believe it? this last minute? it's really not my style) so thought I would share some photos with you before my lovely bridesmaid wears it on the big day and takes the dress away with her! The zip closed - it's a pink silk dupion dress with a yellow zip, and it will be worn with a lemony yellow ribbon. Hand finished zip between the layers. Very wide hem! I had to shorten the dress by a rather lot, but I was too fearful to cut it short at this late stage (especially as I had hand overcasted the bottom of the dress already). I had to include "ruffles" for the hem so that the fullness is distributed evenly. See you after the wedding! I'll have so much to upload then, from the wedding day and the mini-moon! Dear readers, before we start the double bill this weekend, do you like the new look of my blog? It's coming up to a year now since the birth of this baby, so I thought it was time to give it a simpler and fresher look. Anyhow, I was too excited to have finished my second version of Simplicity 2444, and just couldn't wait to share it with you. I think I will gladly add this to my mini-moon wardrobe, and I just hope that the weather will be nice and hot in Paris! I just love how summery it looks - the fabric was a polyester that I bought from my Prague trip. Now I don't usually go for manmade materials other than viscose, but I fell in love with this daisy print and gladly paid about £10 a metre for it. I made a small bust adjustment ("SBA"), having finally come to terms with the fact that I do, in fact, need to do this for most patterns... I think usually commercial patterns "cater for" a B cup, with a number of exceptions (eg Colette patterns have a C cup). I followed the very helpful tutorial here, which oddly meant that I ended up with a bodice pattern with only one set of darts rather than 2! But it did fit me much better. 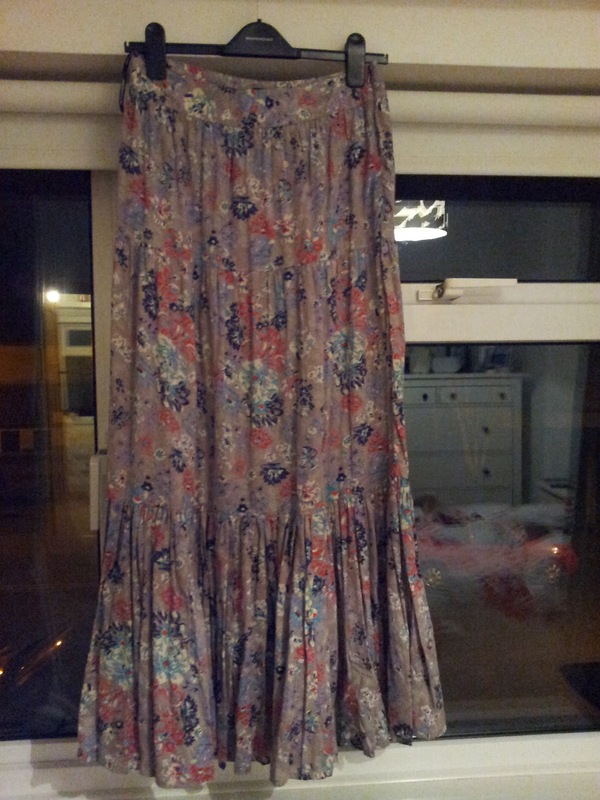 I omitted the centre front seam of the skirt, and cut it on fold instead. To ensure that the side seams still align, I took the seam allowances off at the sides and it worked fine. I took 15cm off the skirt length this time, and was happy with the length. I did the neckline facing, but unfortunately the fabric was rather sheer so it showed through! It bothered me no end so I unpicked it all... and finished the neckline with a self-fabric bias tape instead. And that's it, my second version of the great Simplicity 2444. I love this pattern, especially now I have managed to get it to fit. I can't wait to make it again! Thankfully my sewing machine came to mind. What better way to start my mini-moon wardrobe than making a few items myself? I thought I'd start with a very simple project that I've been wanting to do for ages, a quick refashion. A year or so ago, I bought this maxi skirt in the sale (obviously.. can you see all the price reduction stickers? 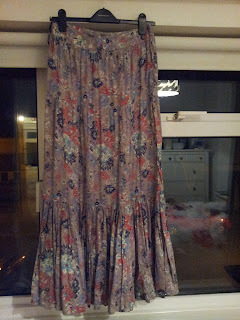 ), which refused to stay on my hips, with the view of upcycling it into a sundress. 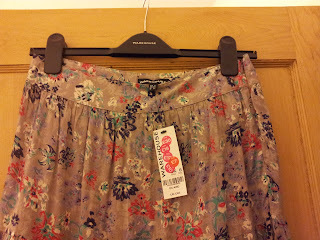 I had my eyes on the super soft floral fabric, the fullness of the skirt, and the pleats at the bottom. One year on, I finally got round to implementing my genius plan. After some mild unpicking, and approx. 3 whole hours of intensive shirring on a school night, my first mini-moon wardrobe item is complete! Finally I inserted some white elastic into the top, et voila! I have a new sundress!